We have found that collecting the center incisor teeth from freshly killed deer to be very easy, actually much easier than removing the jaw bone for the much less accurate eruption wear technique. You will find that with experience you will be able to remove these 2 teeth in 3 minutes or less. First open the deer’s mouth slightly and then take a sharp, thin bladed knife and make a cut between the two center incisors on the inside of the deer’s mouth. The easiest way we have found to make these cuts is by pushing down with the knife making a slow rocking motion until the knife will go no further. 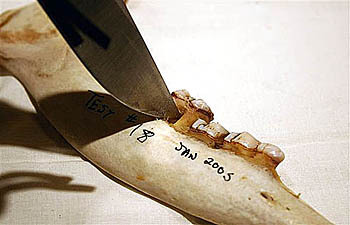 The cut will extend on both the inside and outside of the deer’s teeth and down about three times the distance the teeth extend above the gum line. Make another cut on either side of these two center incisors using the same technique. Then return back to your original cut, insert your blade and make a side to side motion further loosening the roots. Now, with your thumb, apply downward pressure (outward) to one of the incisors until it starts to come loose. There is very little bone/ cartilage supporting the root tips of these incisors, which is why this downward pressure works without breaking off the root. You may need to apply a twisting, pulling force and use your knife to completely detach this tooth from the jaw. Trim any large chunks of flesh away from the tooth and discard. Remove the other incisor in the same manner. Please remember, the root of these teeth, especially the tip, is what we need undamaged to perform the aging service. If you are like us, you probably have saved jaw bones of trophies you have taken in the past, but you don’t have the incisors. Well, we have developed and verified a way to accurately age your trophy by using a molar from those saved jawbones. 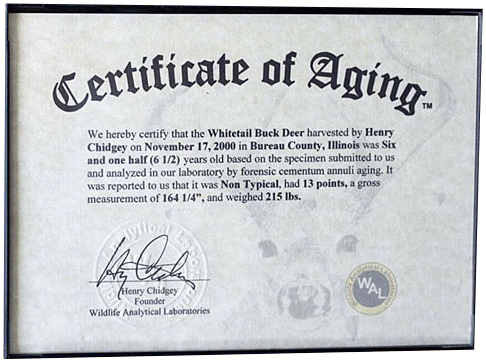 It is called Whitetail Deer Molar Cementum Annuli Aging™, and is offered only by Wildlife Analytical Laboratories. This process yields accuracy of results that are just as good as using the incisors, it just is more difficult and time consuming. A mature whitetail has 3 premolars and 3 molars in each jaw. 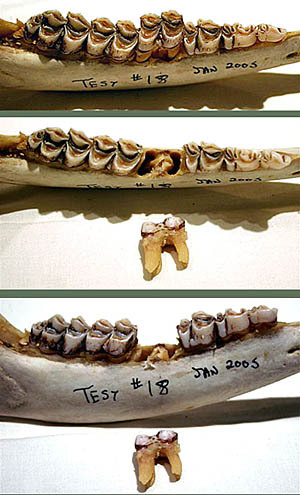 The tooth we want to forensically age is the first molar. (Click to view) This is the 4th tooth from the front of those 6 teeth in the jaw. Removing this M1 molar is very difficult for most folks so we recommend you send the entire side jaw and let us remove it for you at no additional cost. Please refer to the Shipping of Entire Jaws suggestions at the bottom of this page. However if you decide to remove the molar yourself, the easiest way we have found to remove this tooth from the jaw is to immerse the jaw in hot water (just less than boiling) for 4 to 6 hours. Remove the jawbone from the hot water, cool it with tap water, and then using a stiff, pointed tool (we use a fixed blade hunting knife) pry the tooth up from the outside of the jaw. We place the point of the tool in the center (between the roots) of the first molar and pry it up as shown in the photo. (Click to view) When you have the tooth removed, place it in a paper envelope and mail it to us with a submission form and payment for service. (This deer shown in the pictures was 6 ½ years old). Place the skull, jaw bones, or teeth, into a hot water bath at 120 to 160 degrees Fahrenheit (hot but just not boiling) for 1-2 hours to loosen them for extraction. Exposure to excessive heat and/or chemical agents can cause histological damage to teeth. Do not use bleach or other chemicals to clean or loosen the teeth. After you have entered all of your sample information online we will send you a kit with the appropriate return envelopes. Make sure to have your envelope “hand canceled” at the post office to ensure your sample arrives undamaged. This can cost up to $3 in postage and unfortunately will be returned to you if insufficient postage is added so always take it to the counter to ensure it is delivered to us undamaged. Before shipping jaws please help us by being sure meat on the jaw is dry, removed or preserved by leaving in a bag of dry salt for several days. We are sure you all know how nasty and unhealthy rotting meat can be, so please help us with this.